Do you have scabs on your scalp? They may be raised, crusty areas or patches. Some are yellowish, while others are dark brown, reddish or black. They are often itchy, and can bleed sometimes. In this article, we’ll discuss the causes of scabs found on the scalp, the importance of not picking them, and how to treat them. Blisters, crusts and sores are common problems after scalp scratching. What are the Causes of Scabs on your Scalp? People who have scalp-related scabs may wonder why they got them. Some causes include head lice, itchy scalp, dandruff or eczema. They may also be caused by procedures on the hair like braiding, relaxing treatments, bleaching and dyeing. They can even be caused by cancer, although this is not too common. Psoriasis and eczema are not the same disorder, but both may cause scalp scabs. Eczema on your scalp will appear as irritated skin areas, and they are usually itchy. If you scratch them, you will find white flakes within your hair. This is dandruff. 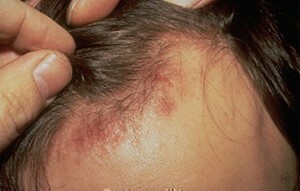 Psoriasis also can cause scalp scabs, but they appear as raised, red patches. They are often flaky or scaly. As they are healing, they form scabs on your head. HIV is a sexually transmitted disease that may come with complications. It weakens your immune system, which leaves your body vulnerable to many types of attacks. Skin disorders you may develop include scabies, seborrhea, warts and scaly, itchy plaques on your scalp. 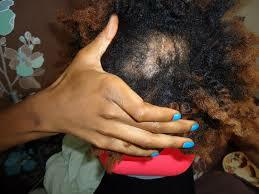 If you only have spreading scalp scabs, they are not, on their own, usually symptomatic of AIDS and HIV. According to the UK’s Lupus Organization, Lupus produces scabs and lesions on the scalp, as pronounced symptoms. Redness, peeling of skin and itchiness may occur if you have Lupus. Scarring may occur, as may rashes and hair loss. Nearly everyone will experience a dry scalp at one time or another. Dry scalp may be chronic, and produces other complications. In many cases, dry scalp occurs in the winter, with its crusts and dry scalp. When you scratch your head, you bruise the skin. But it’s hard not to scratch if your scalp is itchy. Sores and lesions form from the bruising. When the lesions begin healing, you will end up with small scalp scabs. Preventing itching is easiest when you treat the causes, like head nits and lice, eczema, severe dandruff or other causes. Be sure you don’t use hair products that irritate the scalp, like relaxers, shampoos and some hair oils. Dandruff may affect babies, teens and adults of both sexes. The Mayo Clinic reports that it is often a long-lived condition, and it may be difficult to properly treat. It can cause the scalp to become itchy, scaly and flaky. If you have severe dandruff, it may cause scaly, yellow or red pimples, generally behind the ears, on the back of the head and on your hairline. When these pimples break, their healing will cause scabs. Oily scalps are prone to scabs, too. Excessive oil is associated with whiteheads and pimples on your scalp, due to dirt, excessive oil and sweat clogging your pores. These pimples are generally itchy and it’s hard not to scratch them. When you have broken the skin by scratching, the skin heals with crusty scabs. Treating your oily scalp is helpful in ridding your scalp of recurring scabs. If you get an itchy scalp, along with sores and scabs after you have your hair dyed, HealthLine reports that the irritation of the scalp comes from irritation and/or allergic reaction to these products. If you have bleached your hair to lighten the color, the bleach could cause itchy scabs. Bleaching can burn your scalp if it isn’t properly done. The burned scalp forms blisters and sores. Even mild burning can cause crusting of the skin. Bleaching products may irritate your skin, too, especially if you have sensitive skin. Anxiety and stress alone are common causes for spikes of hormones in your body. Similar spikes occur during puberty, periods and pregnancy. When you feel stressed out, you may find smallish, yellow scabs on the scalp. They are caused by pimples. Compulsive picking of your scabs is an additional disorder. You may cause scabs without even knowing it. Bleeding scabs on the eyebrows and hairline may result from picking them overnight. Yellow and white scabs can also be caused by procedures used in styling your hair. Tight perms, weaves, braids and extensions may strain the skin of the scalp, which causes it to break. The lesions formed on your hairline may begin to bleed, which can cause sores and then scabs. If you want to prevent those symptoms, avoid any hairstyles that strain the skin of your scalp, or that cause broken skin on the scalp. Ringworm is fungal, and occurs more in children than adults. When you have ringworm on the scalp, you may develop circular pustule clusters around the area affected. When these dry, they form crusts and scabs on your scalp. The shingles rash is a virus that causes painful blister eruptions on your skin. When they appear on your scalp, you’ll see small patches of crusty scabs on your scalp. These happen because the blisters are drying up, crusting over and forming scabs. Lice don’t transmit any disease, but they are uncomfortable and unsightly. You will feel them moving in your hair, and this prompts you to scratch your head. The itching only gets worse, and the scratching increases, which leads to sores and then scabs on your scalp. The UK’s Cancer Research Centre reports that scalp scabs may be a symptom of cancer, and shouldn’t be ignored. This is particularly true if you get sores and scabs on your head that may crust and continue bleeding for more than a month, without ever healing. According to Salon.com, skin cancer occurring on the scalp is among the more dangerous types of melanoma. The fatality rate is almost twice that of cancers that form elsewhere. It’s easy to identify crusty scabs, but they may be accompanied by other symptoms you need to watch for. Sometimes they become infected, reappear in the same areas, form flakes, bleed, spread and cause possible hair loss. 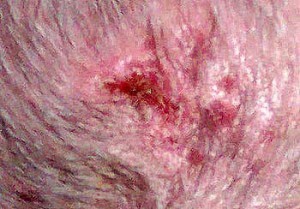 Yellow scalp scabs are usually signs of infection forming within the crust. As this infection progresses, your sores may drain yellow pus. Seek treatment if you have yellow scabs. Your physician will often prescribe an antibiotic ointment that will get rid of this bacterial infection. Shingles may cause yellow blisters and crusts that last two weeks or so before they form scab patches. Topical antiviral ointments and medications your physician prescribes will help in ridding your scalp of the virus. 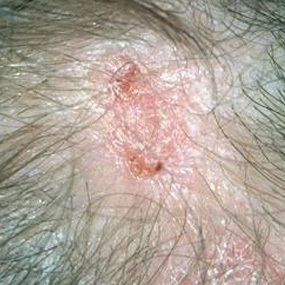 White scalp scabs may signify that pus is developing or that moisture is becoming trapped in the crust. They may also result from prolonged exposure to thick hair lotions or creams. 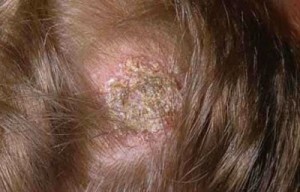 Gray, green or yellow pus in scalp scabs indicates infection. It forms as your body’s white blood cells try to kill infection. As the infected cells are destroyed, pus is formed. If your pus is green, your infection is advanced. These infections may usually be treated successfully with antibacterial medications. 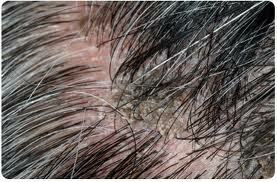 In addition to ringworm, lichen planus also causes scalp scabs that result in loss of hair. It begins with purple or red raised bumps on the skin of the scalp. The scabs from lichen planus cause a loss of hair known as alopecia. It leaves scars on your scalp that may become permanent. It usually clears up by itself, but in the time it is active, it may cause a severe loss of hair. Scabs and bruises that won’t leave, or that recur in the same spots and bleed, shouldn’t be ignored. They may be symptoms of melanoma. Contact your physician for a biopsy and proper treatment, so they don’t spread. Proper care and treatment of the underlying causes, along with home remedies, can help in many cases of scalp scabs and sores. Good hair oils, moisturizing treatments and shampoos, along with other treatments, are helpful in preventing and removing crusty scabs. Topical antibiotics can help in treating infected scabs on your head. They include Polysporin and Neosporin treatments. You can also use OTC anti-fungal treatments to treat sores that were caused by fungus-related infections. If you have allergies and sensitive skin, you can fix the cause of your discomfort. If certain bleaches or hair dyes cause your scalp to itch, use other products. You may also use anti-histamine medicines or medications that treat eczema or atopic dermatitis, which will help in reducing the itch. If your scalp scabs were caused by psoriasis, use a shampoo with salicylic acid. If this doesn’t do the trick, consult with a dermatologist to get a prescription. If dandruff is the problem, OTC shampoos that include selenium and zinc pyrithione will help in controlling the growth of yeast on the skin. Head lice can be treated with prescribed medications. Be sure to wash your hair well, to reduce itching. DIY remedies can reduce scalp scabs by soothing the itch and easing the pain of sores or scabs. Natural moisturizers are helpful. You can also use essential oils and humidifiers to treat your scabs. 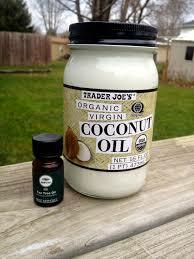 Warm 1/4 cup of olive or coconut oil. Use the oil to gently massage your scalp for five minutes or so. Use a comb to work the oil into your hair. Put a shower cap on and leave it in place for roughly 10 minutes. If you have very dry and itchy scabs, you can leave it on for an overnight period. Rinse the hair and scalp well and clean with a quality moisturizing shampoo & conditioner. This DIY home remedy soothes the scalp, unclogs pores and heals scabs on the scalp. If your itchy scalp problems happen in the winter, when the air is dry, you can use a humidifier to get rid of them. Humidifiers add moisture to your home and stop crusts and scabs on the scalp. Of course, your scabs may itch, but if you scratch or pick at them, this can worsen the problem by causing infection. Picking at sores lengthens the time they will take to heal. Allow the clot/scab to form, and begin the healing process. The crust will keep bacteria out and protect the scab from infection. Squeeze gel from a fresh aloe Vera leaf. Apply this gel on the sores and scabs on your scalp. Leave the gel on your head for at least an hour, or at most overnight. Wash and rinse your hair with medicated shampoos. Continue until the scalp heals. Treating the underlying cause is the most effective way to treat your scalp problems. Identify what is causing the scab formation and get the proper medication to treat it. The proper medications will help you get rid of those lesions, sores, crusts and scabs permanently. Clean your hair and skin well to prevent your pores from clogging, and to prevent zit formation. This VIDEO shows how to treat sores and scabs on the scalp.